It is Motor Trend’s 2014 Truck of the Year and if you have not seen it, you need to go look at one today. The Dodge Ram EcoDiesel is the truck of the year and it is not hard to figure out why. The game changing Dodge Ram EcoDiesel has blasted its way into the market, leaving everyone else in the dust. The ½ ton diesel trucks are not what they were 15 years ago, and if that is what you remember, you are in for a shock. Motor Trend’s judges went all out in pushing this Ram as hard as they could, testing it during hard driving which the majority of drivers would do to a real work truck. Nothing was left to imagination as they pushed, towed, carried and then compared it to all others, to get the correct results. 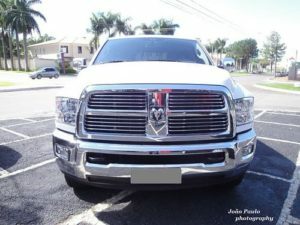 The Motor Trend judges were pleasantly surprised to see the Dodge Ram EcoDiesel pull ahead of the competition with a staggering miles per gallon count. The course that the judges tested on simulated the best and worst driving days of each truck, ensuring to get fair results. Dodge Ram’s engine aside, one look at the truck itself will prove that it deserves the 2014 truck of the year award. The awesome “Ram Box” is the neatest and greatest thing since sliced bread and the cabin of the truck is an amazing feat of engineering. Inside is for working hard, as well as, for carrying the kids to soccer. Everything is laid out nicely on the dash and can be managed easily, with or without work gloves on. All the cabin controls are thoughtfully placed and just enough out of the norm to make them stand out. Motor Trend has been awarding the Truck of the Year award since the 70’s and they have never awarded it to the same truck two years in a row. The judges found they had to pick it again, this second year, because it really does award its owners everything that the Truck of the Year should have. The EcoDiesel is the best truck on the market right now and unquestionably deserves the title. Slide into the seat and look around, you will see exactly what all the fuss is about without even having to turn the key. Once you start to work the Dodge Ram daily, like a truck should be worked, you will understand fully what is so special about this truck.